Known popularly in contemporary Canadian newspaper circles as the “Colonel,” Porter was one of the West’s most colourful press personalities. Born at Russellville, Kentucky on 27 May 1866, he came to Canada at 34, leaving behind an adventure-filled past which included episodes as a legal counsel, Kentucky outlaw and feudist, soldier of fortune, and Yukon prospector. Settling in Toronto in 1900 he entered newspaper work and developed into an ace-reporter for the Toronto World. In 1904 Robert Edwards, the legendary and controversial owner of the Calgary Herald, persuaded Porter to become his Editor-in-Chief. Two years later the newly appointed Editor of the Winnipeg Telegram, Mark Nichols, convinced the “Colonel” that the place to end his wanderlust was the Manitoba capital. At the Telegram Porter was appointed successively News Editor, Managing Editor and Editor-in-Chief. Krafchenko came into the Colonel’s office, brandishing his murder-gun, declaring: “I’m a boiler-maker not a crook.” He waived his union card to prove it. The Colonel, always a fascinated admirer of new things in guns, pointed to the Luger and drawled in his suavest Kentucky accent: “Very nice weapon you have theah.” “Yes, isn’t it?” agreed the criminal, taking his eyes off the Colonel an instant to admire the weapon. In a flash the Colonel had whipped his own six-shooter out of his drawer and had Jack covered. “Drop that gun and get out.” he remarked in his best feud-day anger. Wisely enough Jack did, and the Colonel was one ahead one good gun until the police arrived. Porter left the Telegram in 1916 and soon started his own news service: a one-man version of Canadian Press (CP) he called Porter’s International Press News Bureau. In December 1919 John “Black Jack” Robinson, editor of the true-blue and ultra-Tory Evening Telegram, remembering the Colonel’s skillful handling of other stories for the paper, gave Porter carte blanche on the sensational Ambrose Small story. Though he failed to solve the famous Toronto murder case, the assignment was a dream-come-true for Porter because he wrote a million words on the story for the Evening Telegram and hundreds of other newspapers and magazines. 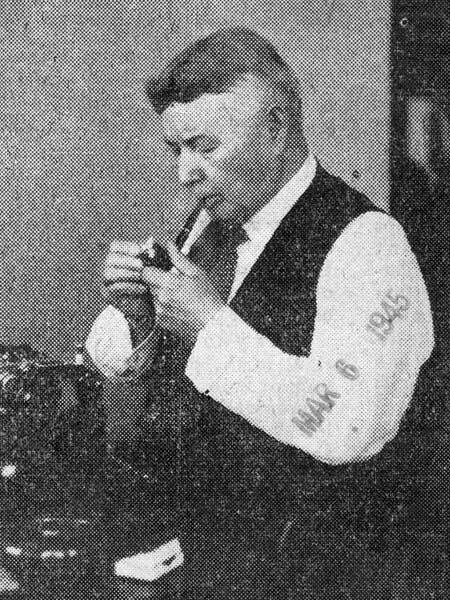 When the Winnipeg Telegram merged with its rival the Winnipeg Tribune in October 1920, the Tribune’s new Editor-in-Chief, Mark Nichols, immediately hired Porter. He served as President of the Winnipeg Press Club in 1926. The Colonel ended his newspaper career as a freelancer, writing a regular column “The Old-Timer Talks” for the Saturday Tribune supplement. He also continued freelance work specializing in crime stories especially written for American detective magazines. The day before he died the Colonel was working at his Tribune desk on copy for his next column. After his death on 6 March 1945, Tribune staff turned off the light on his desk and shrouded the typewriter with his old working jacket. On 19 September 1945, Nichols, then the publisher of the Vancouver Daily Province, unveiled at the head of a double grave (Mrs. Nancy Porter had died in 1937) a memorial stone in Elmwood Cemetery to perpetuate Porter’s memory. This page was prepared by Michael Dupuis and Gordon Goldsborough.